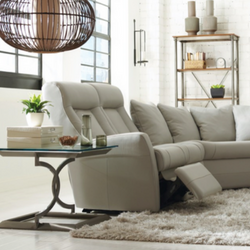 Choose Genuine Leather — Shop for deals on furniture, sofas, recliners, dining sets and more! One of the common terms that causes confusion when shopping for leather furniture today is “bonded leather”. What exactly is bonded leather anyway? The short and easy version is this, bonded leather is not the natural hide of an animal, but left-over pieces of hide blended together with other synthetic materials to form a seamless piece of material. A fun (or rather disturbing) fact I learned when visiting the Natuzzi tannery in Northern Italy several years ago is that the same scraps left on the floor after leather is cut and used to form bonded leather are also the same material you will find in candy!! You know the 5 cent gummies you find at convenience stores. Now there’s something to chew on. Bonded leather allows you to enjoy the look and feel of leather at a phenomenal price, however because it contains such a small amount of real leather it wears out faster, tears easily and is much harder and more expensive to repair. Since its introduction to the market in 2007, bonded leather has been very popular because of its price but consumers are starting to ask for “real” leather again after seeing that the life span of bonded is not that long after all. Genuine leather, or what we at RK refer to as top grain leather is the actual outer hide of an animal and has that gorgeous aroma, buttery feel and warmth we expect. Genuine leather will acclimate to your body’s temperature whether it is hot or cold out but bonded leather does not. In fact, it is colder in the winter and hotter in the summer, just the opposite of real leather. Genuine leather upholstery looks rich and luxurious and isn't just long-lasting, but improves in appearance as the years pass. It is strong, flexible and naturally adapts to the shape of your body to offer the utmost comfort plus it’s easy to care for. In conclusion, if you want something quick and fashionable and if you can afford to keep replacing it, you may prefer bonded leather. However, if you want a good quality product that will look and feel great for a long time, real genuine leather is the only way to go. Did you know at RK Furniture we offer a Free In-Store Consultation to help you create the perfect living space? Book yours today!